People are very fascinated with twins and other multiples. It seems mysterious how one pregnancy can result in more than one baby. Multiple pregnancies are on the rise in recent years with more and more twins and other types of multiples being born. The majority of the reason for this rise is the increased use of fertility drugs. Multiple eggs are released or there is more than one ovulation. Both (or more) eggs are fertilized and this is how fraternal twins are made. This can happen with or without fertility drugs. One egg is released but splits in two. This is how identical twins are made. This can happen with or without fertility drugs. In cases of IVF, there may be more than one fertilized egg put back into the uterus. The rationale is that not all of these will implant, though sometimes they do. Once conceived, you have a lot of possibilities for placentas, implantation locations, the number of amniotic sacs for monozygotic (identical twins). For example, you can have two babies, two placentas, and two sacs. You can have two babies one placenta, two sacs. It will be important to know exactly what you are dealing with, particularly when it comes to amniotic sacs. Many people learn about their multiples at an early ultrasound. 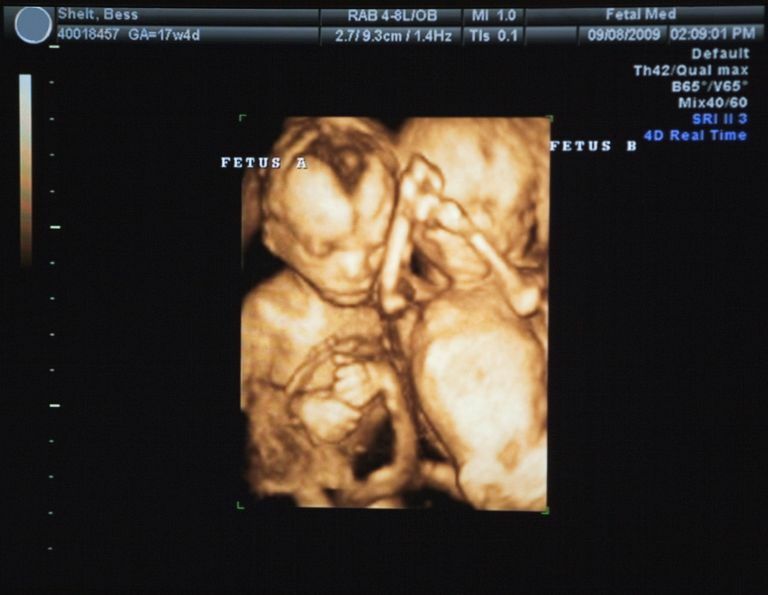 Although some critics say that before twelve weeks gestation there is still a high risk of vanishing twin syndrome (VTS), where one baby stops growing and is either absorbed back into the mother's body or is stillborn when the other twin is born. Some people find a rapid rate of growth in their uterus which leads some to suspect twins. I will say, for all of you second timers out there, that your bellies will grow faster than with your first pregnancy, so don't automatically assume twins. Sometimes multiple heartbeats are heard, leading your practitioner to believe that there is more than one bundle of joy in your uterus. Some women find out when they have abnormally high levels on the AFP test that multiples are on the way since multiple babies would increase the levels of these hormones. It's also sometimes possible to detect multiples with serial hCG levels in early pregnancy. The more babies, the faster the rate of rising hCG which should nearly double every 48 hours with a singleton. A small percentage of all twin pregnancies are undetected until birth. It is possible to have an ultrasound and not see the other baby, though rare. Being pregnant with multiples is not necessarily a high-risk situation, except when dealing with higher order multiples or specific problems. Some parents call it being "high need." This is a positive shift away from the technical side. Find a practitioner who is experienced with multiples births, but one who will not panic at every corner. The more experience a practitioner has, the less likely they are to feel panicked about everything in your pregnancy. You will probably see your practitioner more frequently towards the end of pregnancy. You may have more testing than most women during pregnancy, but not always. Some of these might include non-stress testing, more ultrasounds, etc. Ultrasound may be done every month in the second half of pregnancy. This is to check to ensure that the babies are growing well and growing similarly to one another. This can also screen for potential complications, including twin-to-twin transfusion syndrome (TTTS). In general, you need to increase the amount of protein that you eat. Protein is the building block of every cell in your body and your babies' bodies. It will help you build a good placenta and a strong amniotic sac. A healthful diet will also help fight against infection. More importantly, you need to gain weight earlier in pregnancy than the singleton pregnancy counterparts. This is because the earlier you are likely to have your baby, the more weight they've gained, the better off they are in the NICU. One recommendation is that you gain at least twenty pounds by the twentieth week of pregnancy. There can be a higher risk for complications. You will be monitored for the normal complications of pregnancy like high blood pressure, and fetal growth. However, twins and other multiples can have higher incidences of things such as intrauterine growth restriction (IUGR), twin to twin transfusion (TTTS), preeclampsia, gestational diabetes, preterm labor and delivery, congenital malformations. and others. Remember to keep your appointments, watch your diet and do your fetal kick counts. In years past, cesarean became popular for multiple births. Now the American College of Obstetrics and Gynecologists (ACOG) recommends that a vaginal delivery is attempted as long as the first baby, Twin A, is head down (vertex). We've found that vaginal birth is usually very safe for multiples, who frequently need the stimulation and rise in hormones levels associated with labor. Whether or not you will have a vaginal birth will depend on many factors, including the position of the babies, and how the babies tolerate labor. If your babies are in a position where neither can move, they are said to be locked. These babies will have to be born via cesarean. Breech babies really depend on the size of the baby and the skill of the practitioner. Usually, if Baby A (The first baby in the pelvis.) is head down a vaginal birth will be attempted. If Baby B is breech or transverse an internal or external version may be attempted to help facilitate the birth or that baby may be allowed to be born breech. Monoamniotic twins, where both babies are in one sac, will also be born via cesarean, due to the added risk of cord entanglement. No matter how your twins were conceived, or how they were born, babies are delightful. Parenting multiples has its special challenges, but it also yields special rewards. American College of Obstetricians and Gynecologists (College); Society for Maternal-Fetal Medicine, Caughey AB, Cahill AG, Guise JM, Rouse DJ. Safe Prevention of the Primary Cesarean Delivery. Am J Obstet Gynecol. 2014 Mar;210(3):179-93. doi: 10.1016/j.ajog.2014.01.026. Fuchs F, Senat MV. Multiple Gestations and Preterm Birth. Semin Fetal Neonatal Med. 2016 Jan 12. pii: S1744-165X(15)00149-3. doi: 10.1016/j.siny.2015.12.010. Goossens SM, Hukkelhoven CW, de Vries L, Mol BW, Nijhuis JG, Roumen FJ. Clinical Indicators Associated With the Mode of Twin Delivery: An Analysis of 22,712 Twin Pairs. Eur J Obstet Gynecol Reprod Biol. 2015 Dec;195:133-40. doi: 10.1016/j.ejogrb.2015.09.034. Schmitz T, Carnavalet Cde C, Azria E, Lopez E, Cabrol D, Goffinet F. Neonatal Outcomes of Twin Pregnancy According to the Planned Mode of Delivery. Obstet Gynecol. 2008 Mar;111(3):695-703. doi: 10.1097/AOG.0b013e318163c435.